Steeplekeeping and a little bit more! 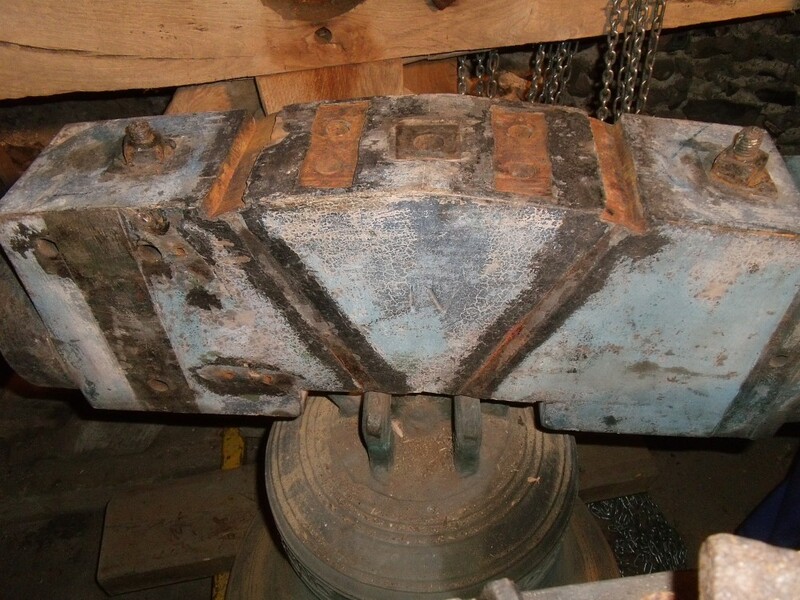 When a bell installation gets restored and rehung there are often still serviceable bits that get scrapped in the process for perfectly good reasons. 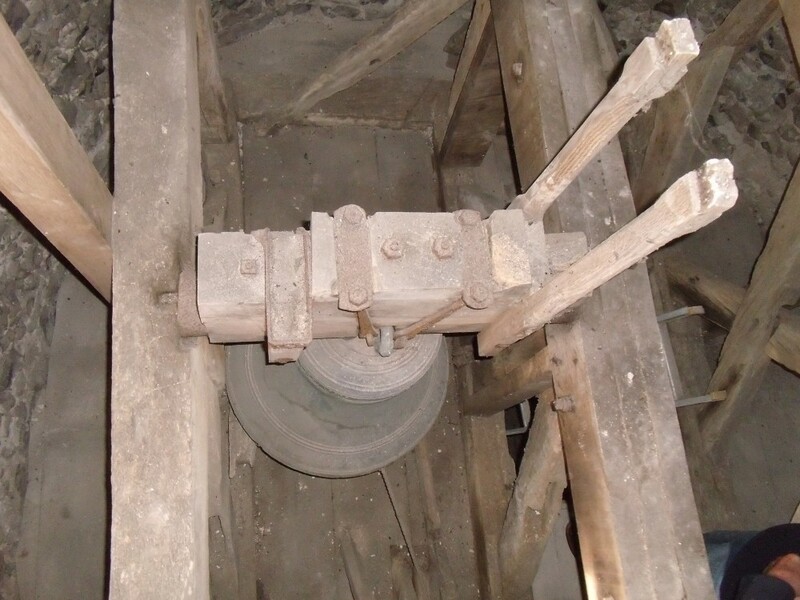 The replacement of fittings that are less than efficient for change ringing can however be possibly still useful for the swing chiming of single bells. 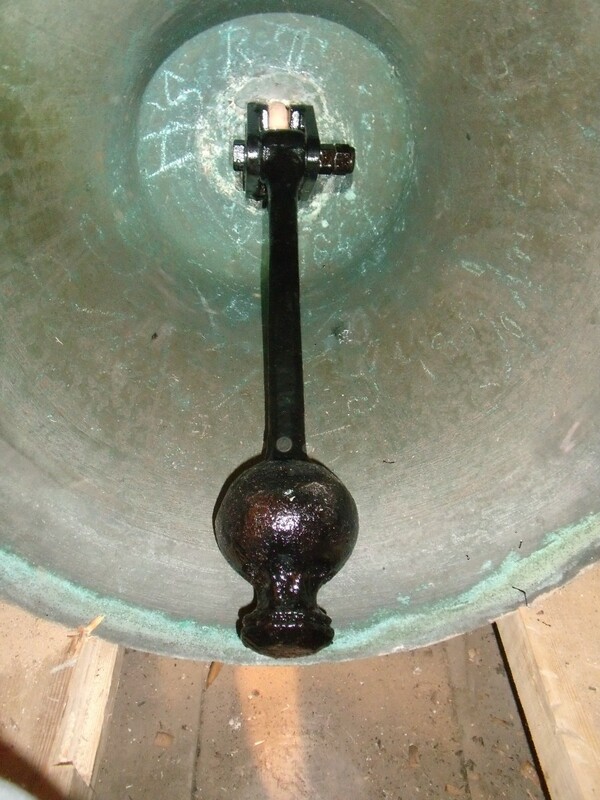 When that single bell has fittings so derelict and unsafe that the bell can no longer be rung, and the (on average) £6000 required for a bellhanger to bring it back to use with all new parts is beyond the means of a parish, then the possibilities of recycling are well worth considering.. There was one tower which I had recently visited with a derelict single bell that was going to cost a disproportionate amount to restore so I had a theory in mind that might use some of these bits. 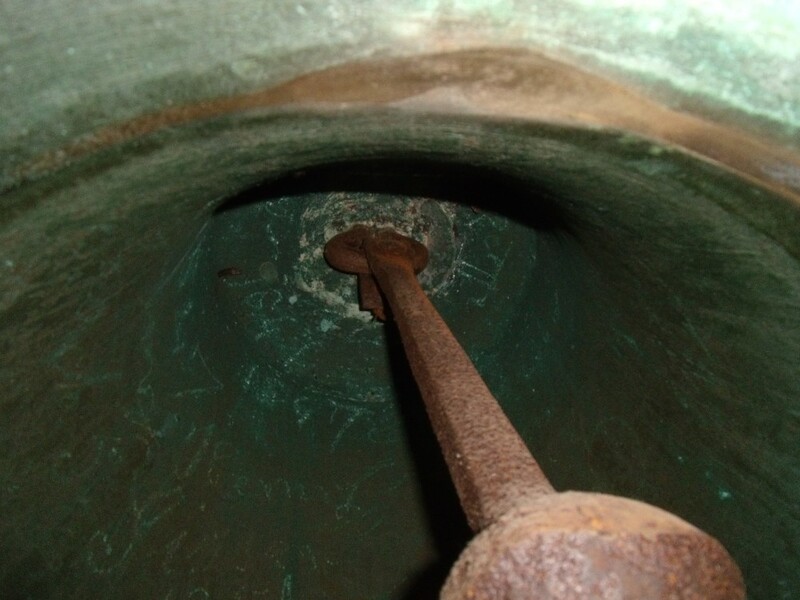 A preliminary measuring showed that the old 4th bell headstock might fit the pit at Bawburgh St. Mary and St. Wulstan and was about man enough for the weight of the 1635 Brend bell that was currently dangling askew in the pit. If this did fit the bill then it was definitely something that Hedley Mines from East Rudham and I could consider taking on as a steeplekeeper’s rehang. Hauling the headstock up the tower proved well worth the effort because, there being no such thing as standard widths, it was simply luck that it fitted ideally. In fact the gudgeons would even have fitted the existing bearing brasses but unfortunately they had become seriously out of alignment which was one of the reasons for the listing bell. We then raised the bell out of the pit and dismantled the old headstock and fittings so the salvaged headstock could be fitted. It was apparent that we would need to turn the bell at 90 degrees to allow the clapper to strike on fresh metal as the intervening years had seriously worn the soundbow. Normal bell foundry practice with a bell of this age is to drill out the cast in crown staple and fit an independent clapper staple that can be set to swing in any direction. 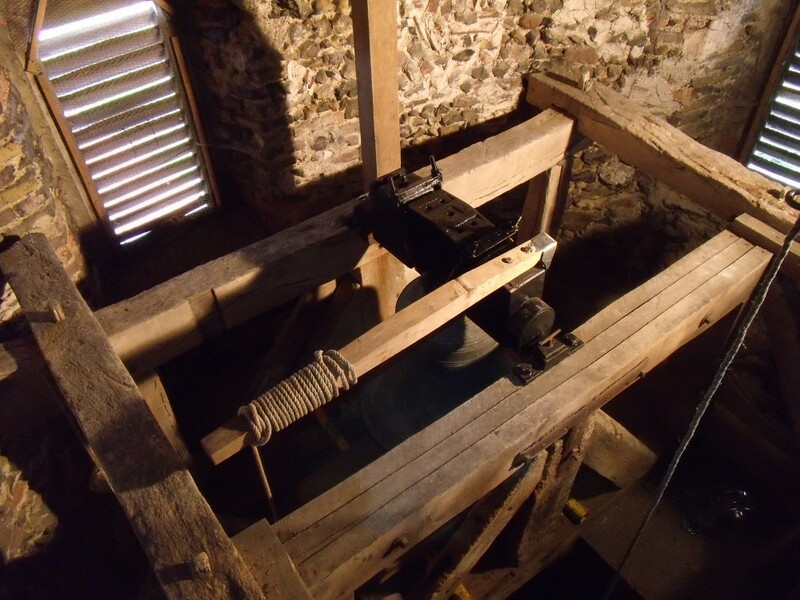 In this case we were unable to carry out this process in the belfry and therefore would need a “reversing block” to allow the clapper to swing in the quarter turned position. The old clapper would now be too long and would need a good deal of reshaping if it were to be used again. Once more to the rescue, a clapper from Saxlingham Nethergate looked as if it would be adaptable for the purpose. Disappointingly, from the salvaged strapwork, a set of straps designed to hang a quarter turned bell were just not quite long enough. Nevertheless armed with the undersized straps, a clapper in need of a reversing/clamping device and a couple of photographs and measurements I went for a chat with our local engineering firm R.B.S. Engineering Ltd. of Testerton. They agreed to have a go at interpreting my intentions and I went away and left them to it. In the meantime Hedley and I had been to King’s Lynn St Nicholas to assist in the removal of the bells as part of the rehanging to be carried out by Whites of Appleton. Once more the fittings were to be discarded and I was able to take back 5 sets of heavy cast bearing housings complete with brasses, a wheel and some stays. Again, good fortune was with us and just one pair proved an acceptable fit with the headstock gudgeons. 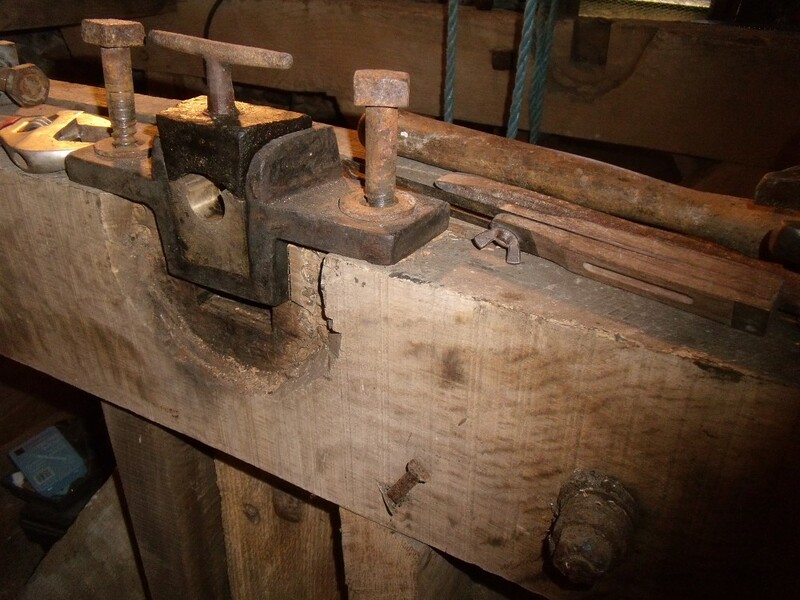 These simple solid pieces of Taylor;s 1869 engineering provided a far more stable and level set of bearings than would have been the case had we reused the plain 18th Century brasses that had been there. 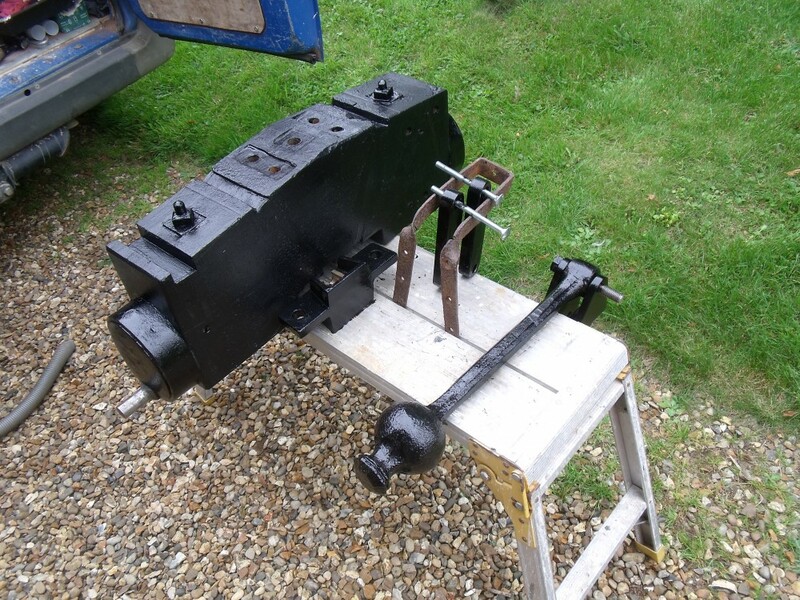 Saxlingham scrap metal provided the 4 heavy duty coach screws that were needed to secure the housings to the old oak frame. Although we had a choice of wheels, as this was to be swing chimed only, a lever arm was all that was required. King’s Lynn to the rescue this time and one of their long stays was selected for the job. I picked up the collection of new metalwork from RBS and as the theory was still looking good, the following day we went back to the belfry to put this motley pack of bell bits together. I wouldn’t say we were surprised, though perhaps a little relieved that the theory worked first time. 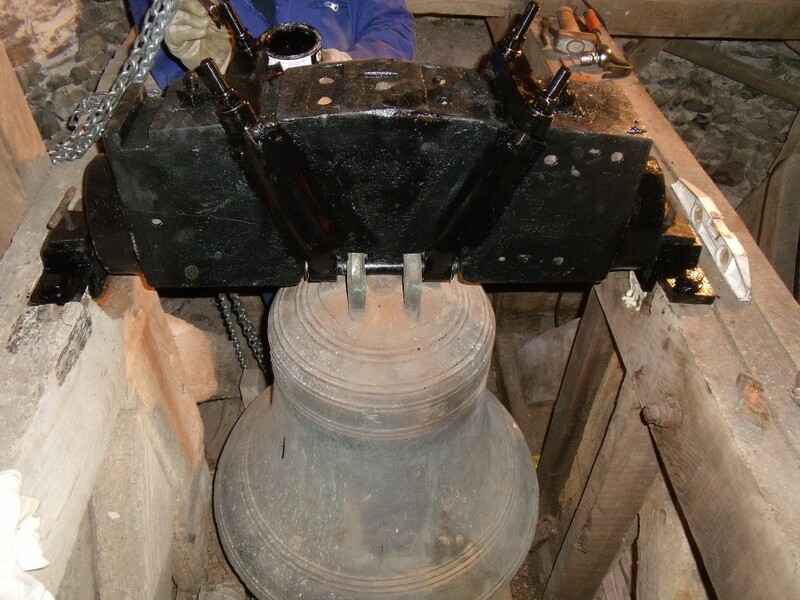 The initial sounds from the belfry brought a delighted churchwarden to the base of the tower as we lowered components to the ground for a coat of paint before final assembly. We were all reassembled, roped down to the ground with a reclaimed bell rope from Necton tower, tested and ready to leave by 4.30 having had a most satisfactory day all round. the restored Brend Bell, as she told us her name, Mrs Brenda Bell!